Built: 1828, Christian Bergh & Company, New York City, New York, U.S.A. This ship is small by current standards for passenger and freight ships. It is virtually the same size as the Brig Niagara which successfully defended the American interests in the Battle of Lake Erie during the War of 1812. The Charlemagne appears to be no portholes, nor any life boats. Quarter boats (rowing boats) were later added to the fantail of the ship for service as utility boats, and perhaps lifeboats. Considering the passengers and crew of approximately 150/160, these two small boats were hardly adequate for use as lifeboats. The overall space available on the ship was about 7,000 square feet. That is two-and-a-half times the average home size in the U.S.A. in 2002. Space would have been very cramped in the steerage areas. NOTE: Do not confuse this ship with a second ship named Charlemagne that was built at Thomaston, Maine, in 1843 and was 741 tons. 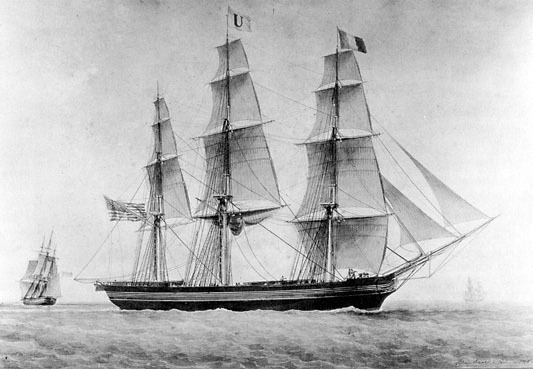 This ship provided similar services in the 1850s.